“He was just a shell. He was gone.” Tracy Strawberry describes how she saw her husband, baseball legend, Darryl Strawberry, when she repeatedly found him in crack houses, curled up in a corner, out of his mind on drugs. How does a man fall from the pinnacle of success, losing everything in his pursuit of the next high, the next drug? How does that man find his way back to a place of peace and purpose? Is it possible to come back from full blown heroin addiction? Tracy and Darryl Strawberry exclaim that no matter how low you may have fallen, Jesus is there to pull you back, to a place of forgiveness and redemption. Sometimes it takes a place of darkness to reveal the treasures of salvation and healing. Are you or is someone you love in that dark place of despair? You can hear a remarkable story of redemption from Darryl and Tracy Strawberry on April 24, 8:00 p.m. via live streaming at www.markinc.org. We (Chuck and Sharon Betters) will share our own story of redemption and what drives us to offer the help and hope that only Jesus gives. When our sixteen-year-old son, Mark, and his friend Kelly died in a car accident, we struggled to reconcile God’s sovereignty with His love. He gave us the promise of Isaiah 45:2-3: I will give you treasures in the darkness, riches stored in secret places, so that you will know that I am the Lord your God, the One Who calls you by name. Tune in to www.markinc.org on April 24, 8:00 p.m. and along with Darryl and Tracy Strawberry, we will share with you some of those treasures that helped turn our hearts toward Jesus. ​WATCH VIA Livestream: FREE Event! You are invited to experience extraordinary worship music and hear the supernatural work of grace in the lives of Baseball Legend Darryl Strawberry and his wife Tracy on April 24. Darryl’s amazing baseball feats cannot compare to the supernatural accomplishment of Jesus in transforming two broken people into a family with purpose and joy. Darryl and Tracy hold nothing back when they share their story of falling from the top of an extraordinary baseball career into a pit of drug addiction that seemed impossible to survive. Darryl lost all the money he earned as a baseball star. Tracy gave up custody of her children. Tracy regularly searched for Darryl among the homeless where he landed again and again, addicted to drugs. But Jesus! Along with the Strawberrys, Chuck and Sharon Betters will share their own story of redemption and how God is redeeming their pain through In His Grip. You can experience this amazing night with people from all over the world via live streaming. 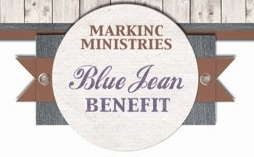 Go to www.markinc.org, Friday, April 24, 8:00 p.m. EST and click the Blue Jean Benefit Link. Originally published April 20, 2015.